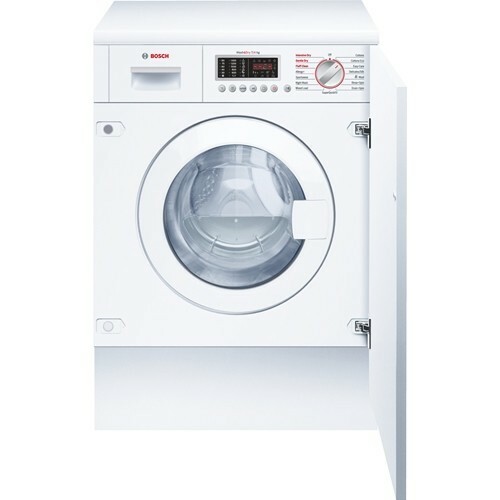 The Bosch WKD28541GB 7kg/4kg 1400rpm Washer-Dryer comes with nine different wash programs and two drying programs to choose from. With a wash capacity of 7kg there is plenty of room for a large load and it is rated A for wash performance thanks to the ActiveWater technology that means it uses only the exact amount of water necessary for each wash. This washer-dryer also features a Night Wash mode which runs more quietly than normal and allows you to take advantage of cheaper night electricity tariffs. You can also program the dryer to operate immediately following a wash cycle. With a 4kg capacity, there is plenty of room to dry your clothes ready to be transferred immediately to cupboards and drawers without having to air them out. This helps to save you time and energy, meaning you have to spend less time on laundry tasks.